All ASV levers feature a special pivot design that allows the lever to fold out of harms way in the event of a crash or tip-over of the bike. Instead of bending or breaking, ASV levers simply pivot outward when impact occurs, and spring back instantly. The pivot junction uses a pair of high quality chrome steel, ABEC rated precision sealed bearings for years of smooth operation and zero "play" or "slop". A special high-tension chrome silicon cantilever spring returns the lever back to its original position instantly and does not allow the lever to pivot at all while riding. This high quality spring is rated for over 100,000 rotations without losing it's original tension. 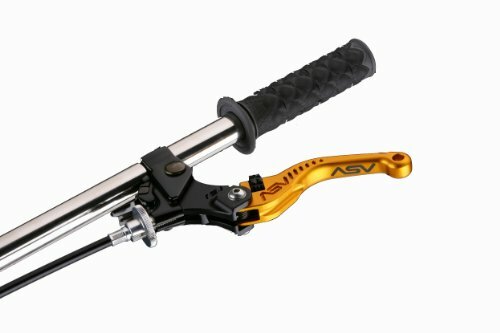 All ASV levers feature an adjustable reach. By simply adjusting a setscrew on the lever, the reach (distance from the handle bar to the lever) can be adjusted to accommodate the smallest to the largest hands. A specially designed acorn style lock nut keeps the setscrew secured in your desired position and is out of harms way. All ASV levers use the same high quality components including chrome steel precision sealed bearings, stainless steel pivot and bushing parts, chrome silicon cantilever springs, aerospace grade stainless steel and chromoly fasteners, and specially designed and manufactured fasteners. ASV levers are also completely rebuildable and serviceable with no special tools required. All ASV levers include a guarantee against breakage. If you have any questions about this product by ASV Inventions, contact us by completing and submitting the form below. If you are looking for a specif part number, please include it with your message.